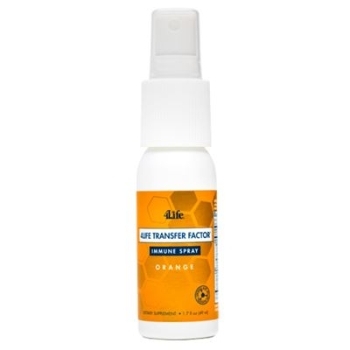 Transfer Factor Immune Spray is a great-tasting formula that combines the anti-bacterial properties of colloidal silver with the immune power of Transfer Factor XF. Available as an easy-to-dispense, mint or orange-flavored throat spray, Transfer Factor Immune Spray contains no artificial colors, flavors, sweeteners or preservatives. And, because Transfer Factor Immune spray is delivered through the mouth, it directly affects the mucosal tissues, directly supporting a healthy immune response in one of the most susceptible areas. This outstanding supplement will make an excellent addition to your arsenal of immune boosting products. Nanofraction molecules possess natural intuition and function as part of the complex "command and control" network of the immune system. NanoFactor is 4Life’s patent-pending extract of nanofraction molecules from cow colostrum. 4Life Transfer Factor Immune Spray contains no artificial colors, flavors, sweeteners, or preservatives. This formula is available as an easy-to-dispense fresh mint or citrus orange spray. "Recently my throat felt really scratchy and irritated. I was already taking Transfer Factor and I also used the Transfer Factor Immune Spray. I was pleasantly surprised by the taste. I continued to use the spray for two days. I was very, very pleased to be able to turn it around. I used Transfer Factor combined with the Transfer Factor Immune Spray."